iMacsoft DVD to iPhone Suite for Mac, powerful Mac DVD to iPhone Converter and Mac iPhone Video Converter suite designed just for Mac OS X (including Mac OS X 10.10 Yosemite, Mac Intel and Mac PowerPC) users, can rip DVD and convert all popular video files to iPhone video MPEG-4, H.264/MPEG-4 AVC, widescreen iPhone MPEG-4 and iPhone audio MP3, WAV, M4A, AAC with high quality and fast conversion speed. iMacsoft DVD to iPhone Suite for Mac includes two practical products: iPhone Video Converter for Mac and DVD to iPhone Converter for Mac. iMacsoft DVD to iPhone Converter for Mac is easy-to-use and powerful Mac DVD to iPhone converter software for iPhone 3, iPhone 4, iPhone 5, iPhone 5S/5C, iPhone 6/6 Plus, iPod shuffle, iPod shuffle 6G, iPod classic, iPod nano, iPod nano 5G, iPod nano 6G, iPod touch, iPod touch 4, iPad, iPad 2, the new iPad, iPad mini, iPad 4. iMacsoft DVD to iPhone Converter for Mac can easily convert almost all kinds of DVD movies to iPhone video MPEG-4, H.264/MPEG-4 AVC and iPhone audio MP3, M4A, AAC with the latest H.264 video encoding technology. iMacsoft iPhone Video Converter for Mac is a very powerful and easy to use Mac iPhone Video converter, which can convert all popular video formats such as WMV, RM, RMVB, MKV, MOV, DAT, VOB, MPEG, FLV, AVI, DivX, XviD, etc. to iPhone movies MP4, widescreen iPhone MP4, iPhone 3G MP4 video or iPhone 3G MP4 video for playback on iPhone 3, iPhone 4, iPhone 5, iPhone 5S/5C, iPhone 6/6 Plus, with various settings and very fast iPhone movie conversion speed. Try iMacsoft DVD to iPhone Suite for Mac free now and enjoy your favorite DVD and videos on iPhone 3, iPhone 4, iPhone 5, iPhone 5S/5C, iPhone 6/6 Plus, anytime and anywhere! iMacsoft DVD to iPhone converter for Mac can easily convert almost all kinds of DVD movies to iPhone MPEG-4, H.264/MPEG-4 AVC, MOV video formats and iPhone MP3, M4A, AAC, WAV audio formats with the latest H.264 video encoding technology. 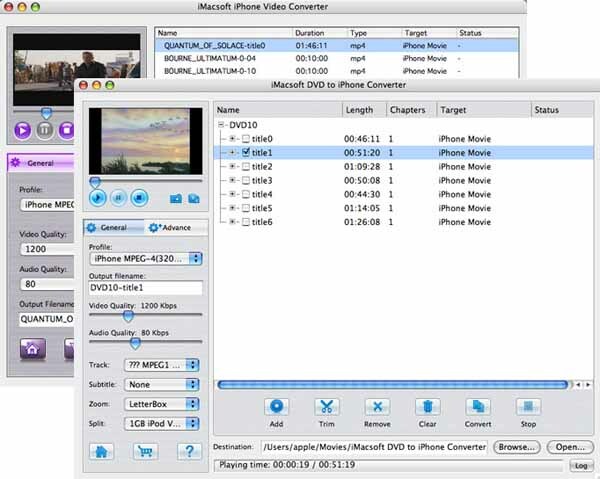 iMacsoft iPhone Video Converter for Mac can convert all popular video files, such as AVI, MPEG, WMV, MP4, VOB, MOV, DivX, XviD, RM, RMVB, MKV, FLV, SWF, etc. to iPhone MPEG-4, H.264/MPEG-4 AVC videos. iMacsoft iPhone Video Converter for Mac can convert video files and audio files like MP3, MP2, AAC and AC3 to iPhone audio formats, including MP3, M4A, and WAV on Mac. You will enjoy your favorite DVD movies and videos on your iPhone 3, iPhone 4, iPhone 5, iPhone 5S/5C, iPhone 6/6 Plus, iPod shuffle, iPod shuffle 6G, iPod classic, iPod nano, iPod nano 5G, iPod nano 6G, iPod touch, iPod touch 4, iPad, iPad 2, the new iPad, iPad mini, iPad 4, etc. anytime and anywhere. iMacsoft DVD to iPhone Suite for Mac is professional Mac iPhone Video Converter and Mac DVD to iPhone Converter developed specifically for Mac OS X users. iMacsoft DVD to iPhone Suite for Mac supports both PowerPC and Intel processor Mac computers. With the built-in player, you can preview the loaded video and take snapshot of your beloved movie screen. iMacsoft iPhone Video Converter for Mac allows you to easily check the parameters of the source files including bit rate, frame rate, duration, sample rate, channels, etc. to make video and audio conversion more convenient. iMacsoft DVD to iPhone Suite for Mac includes General Settings and Advanced Settings for professional users. These settings include audio bit rate, frame rate, duration, quality, audio codec, etc. Supporting multithreading and batch conversion, this Mac iPhone Video Converter and Mac DVD to iPhone Converter provide up to 300% conversion speed. iMacsoft DVD to iPhone Suite for Mac supports multiple languages such as simplified Chinese and English. iMacsoft DVD to iPhone Converter for Mac is easy-to-use and powerful Mac DVD to iPhone converter for iPhone, iPhone 3, iPhone 4, iPhone 5, iPhone 5S/5C, iPhone 6/6 Plus, iPod shuffle, iPod shuffle 6G, iPod classic, iPod nano, iPod nano 5G, iPod nano 6G, iPod touch, iPod touch 4, iPad, iPad 2, the new iPad, iPad mini, iPad 4. It can easily convert almost all kinds of DVD movies to iPhone video formats MPEG-4, H.264/MPEG-4 AVC and iPhone audio formats MP3, M4A, AAC with the latest H.264 video encoding technology. iMacsoft iPhone Video Converter for Mac is a very powerful and easy to use Mac iPhone Video converter, which can convert all popular video formats such as WMV, RM, RMVB, MKV, MOV, DAT, VOB, MPEG, FLV, SWF, AVI, DivX, XviD, etc. to iPhone movies MP4, widescreen iPhone MP4, iPhone 3G MP4 video or iPhone 4 MP4 video for playback on iPhone 3, iPhone 4, iPhone 5, iPhone 5S/5C, iPhone 6/6 Plus, with very fast iPhone movie conversion speed.